This whole year of renting I have been so good about not buying new things, but finding a new home is taking longer than I had hoped and it is time for a few small changes. Our bedroom needs an update, our furniture is unchanged from our old house, see here for what the space looks like now (bad iphone pic alert). I love our rug, it is so soft and cosy to walk on, but I am really tired of my badly made head board (#notagooddiy) and the black bedside lamps are just not working for me any more. 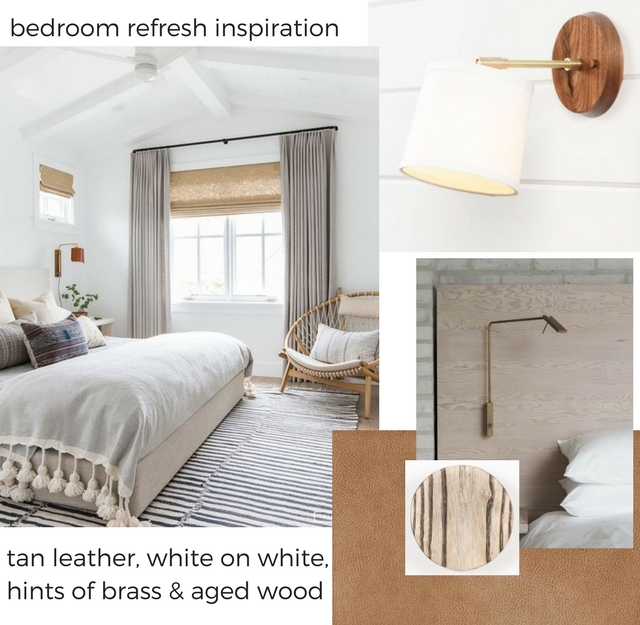 I am feeling very inspired by the bedrooms created by Amber Lewis (above left) which are fresh and peaceful but for sure not boring. Her designs always feel warm, even though the palette is very restrained. I am totally in love with the Aspen sconces by Worley's Lighting (their lights are amazing!) but the problem is we can't fix them onto the wall since we are renting. I don't love a wooden headboard, bit to hard, so I am going to wrap the wood directly behind the bed with this gorgeous faux leather from Warwick, Eastwood in fawn. It is a lovely fabric, easy to cut and sew, I used it to make some cool outdoor cushions. The sconces will be as above except that the back plate will be in aged ash (circle of wood above) rather than walnut. I love grey tones in wood. So now I have a plan, I have ordered the lamps, and I just have to find a way to make the rest of it happen. Watch this space. It feels really good to be plotting some diy again, tinkering on our home is probably the thing I miss most about renting rather than owning.